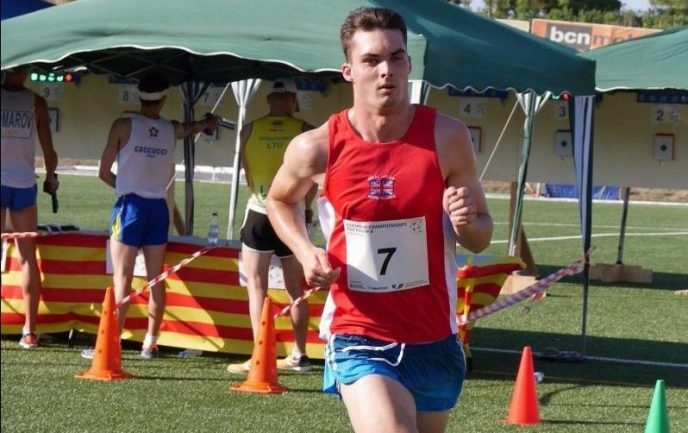 The Pentathlon GB Youth A team finished the European Championships with a flourish as they secured a double medal haul on the final day of the competition yesterday (July 31st). Harry Sykes and Josh Miller won gold in the Boys’ relay with Kerenza Bryson and Myles Pillage claiming bronze in the Mixed Relay in Sant Boi. Olivia Green and Zoe Gowers finished 7th in the Girls’ relay to complete a successful day and Championships for the team. Miller and Sykes, who both graduated from Hartpury College this year started their day in the pool. Despite the swim not being the strongest discipline of either athlete, the duo teamed up well to record a 200m time of 1:51.52, the second quickest of the event. A fantastic fence from the British duo meant they finished joint top of the discipline standings with 31 victories and 17 defeats. Miller’s contribution of 18 victories and just 6 defeats was the best individual performance and meant that the pair started the combined run-shoot in 2nd, just 2 seconds behind the leading Ukranian team. With the Ukranian duo faltering, Oxted’s Miller and Worcester’s Sykes took the lead before being closed down by the Polish pair. However, Sykes’ sprint finish saw the Brits claim gold. In the Mixed relay, Plymouth duo Kerenza Bryson and Myles Pillage also started their day in the pool, with their time of 1:55.91 second quickest. In the fencing salle, 14 victories and 12 defeats saw the British duo finish 5th in the discipline standings with 17 year old Bryson’s 10 victories and 3 defeats the 2nd best individual performance. This meant Plymouth Studio School’s Bryson and Plymouth College’s Pillage started their combined event in 4th but with a 21 second deficit to the podium positions. Bryson had closed that gap by the end of her 2 shoots and 2 x 800m runs meaning Pillage’s concern was the known quick runners behind him. However, strong shooting and another gutsy sprint finish saw him hold on to the duo’s bronze medal. The third relay of the day saw Olivia Green and Zoe Gowers in action in the girls’ relay, starting with the fencing. 21 victories and 19 defeats followed by a strong 2:06.43 swim meant the British duo headed into the closing run-shoot in 6th. In a tightly bunched field, Weymouth’s Gowers and Oldham’s Green held their own during the closing discipline, eventually crossing the line in 7th. In the individual competitions earlier in the week, Bryson, Green and Georgia Hannam took team bronze if the girls’ competition by virtue of their cumulative individual performances. Bryson recorded the best British individual performance by finishing 6th. The Plymouth Studio School athlete, who won the U19 Girls British Modern Pentathlon title last month, started off with a 2:19.91, a PB performance in the swim before finishing 2nd in the fencing standings with 23 victories and 11 defeats. This meant she started the run-shoot in 6th, a position she held on to at the finish. 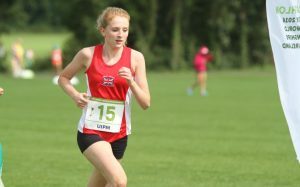 Consistent performances across all 4 disciplines from Olivia Green and Zoe Gowers – who was making her debut at a major Youth A Championships – saw them finish 15th and 23rd respectively whilst Morecambe’s Georgia Hannam finished 28th despite injuring her hand whilst fencing. It meant the pre-nominated team of Bryson, Green and Hannam claimed team bronze behind Russia and Italy. In the Boys’ individual competition, Myles Pillage finished 8th, including a stunning 1:54.37 swim, backing up his 9th place at the Youth A World Championships in Limerick earlier in the month. Josh Miller finished 21st with Harry Sykes 28th meaning the trio finished 5th in the team competition. 16 year old George Budden, making his debut at a major Youth A competition, put up a strong performance in all 4 disciplines in qualifying, but narrowly missed out on a place in the final.